Foam materials are formed by trapping pockets of gas in a liquid or solid. In open-cell foams, these pockets are interconnected. When an open-cell foam isn’t compressed, substances such as air, water, and chemicals can enter the cells. With closed-cell foams, the cell or pockets are filled with nitrogen gas instead. This prevents the passage of air, water, and chemicals to and from the environment. 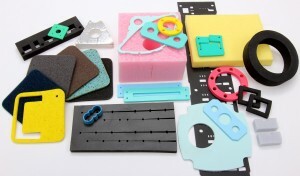 Interstate Specialty Products custom-manufactures gaskets and other die cut parts from foam rubber materials. Application requirements and environmental conditions determine whether an open-cell foam or a closed-cell foam is right for your application. Typically, foam rubber is made of polyurethane (PU) or polyethylene (PE) for medical, laboratory, electronics, and industrial applications. Open-cell foams are used in prosthetic devices, specialty sponges, electrocardiogram (ECD) pads, medical filters, and sterilization bags. Reticulated polyurethane foams are used widely in healthcare and laboratory environments because they are easy-to-clean and can be compounded with bactericides, fungicides, and other additives. Interstate Specialty Products also die cuts parts made of open-cell foams for electronic components and industrial packaging. Open-cell polyurethane foams provide outstanding cushioning and are often used to protect sensitive electronic devices. Reticulated foams with controlled porosity offer greater tensile strength and tear resistance, and are used in acoustic insulation. In laboratory and medical applications, closed-cell polyethylene foams are common in device packaging. They’re also used in sanitary or hygienic applications because their nitrogen-filled cells prevent the passage of bacteria, liquids, or blood-borne pathogens. Closed-cell foams that are non-toxic and hypoallergenic are used in surgical operating rooms, too. Interstate Specialty Products also custom-fabricates gaskets and other die cut parts made of closed-cell foams for electronic components. Cross-linked polyethylene combines insulation and vibration dampening properties with resistance to moisture and chemicals. This closed-cell foam is used to protect sensitive industrial equipment and, in automotive design, to protect the styling on Class A surfaces. Interstate Specialty Products is ready to answer your questions about open-cell and closed-cell foams, and to recommend the right foam rubber for your medical, laboratory, electronics, or industrial application. To learn how our custom manufacturing capabilities can support your product designs, contact us on-line or call (800) 984-1811.